I was a big fan of the Green/Johnson run on Superman/Batman, as while they weren't perfect, they had a certain charm and fun to them, while staying true to the main characters and their relationship, actually saying something about it. So, as they are now officially, well for a while now actually, moving on to bigger and better things from the title, I thought I'd post certain scenes from their first issue, which had me laughing at several points. I know somebody has asked for the Starro cupcake scene before. Well, here you go, along with lots of other goodies. 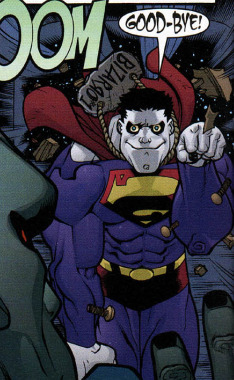 Ah, Superman/Batman, you always deliver teh crack. I was revisiting the Torment arc in Superman/Batman and discovered this little gem of a page in issue no. 41. Edit: The image links to a bigger size. IGN has more of the coming covers for Blackest Night in October. Current Music: NIN: They keep calling me. One of the biggest losses after the Great Supergirl Retcon Distaster of 1986 was the loss of the friendship between Supergirl and Batgirl. While never utilised like it should have been it had its moments. In light of the post on noscans_daily about female friends in comics I offer something more wholesome and heartwarming. Also I bring news that Supergirl will team up with the new Batgirl in Worlds Finest #3 at the end of the year. One page from Superman/Batman #61, and the resolution of a previous quandry. So I was writing my Pull List article for my website tonight, and I noticed something about the Superman/Batman #61 cover that I wanted to ask you guys about. 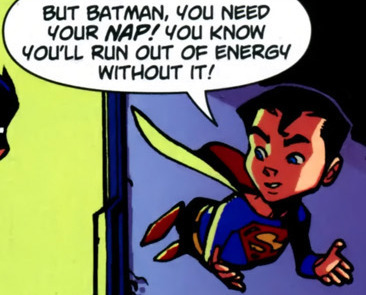 Two panels from Superman/Batman #7.